Tutus for Toddlers are relatively easy to make, the kids love them and they retail for $30 or more in the store so it's time to get out the tulle ribbon and give it a try. Best thing is, these tutus require very little sewing. - 3 rolls 3 inch tulle ribbon (I found this online. Use Six inch for an older child) You can use different colors or the same color depending on your preferences. Cut your elastic to fit the child's waist - make sure you have four extra inches on each end. We knotted it in a loose knot. Cut your Tulle. The best way to do this is to measure how long you want the skirt and add two inches. Measure and cut the cardboard to this length. 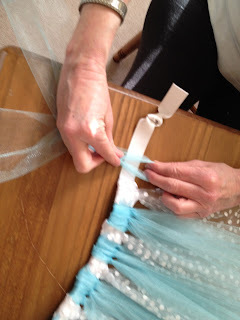 Wrap the tulle around the cardboard three or four times. Cut the tulle ON ONE SIDE ONLY. This will give you the strips you need to work with. They will be more than double the length of your final tutu skirt. 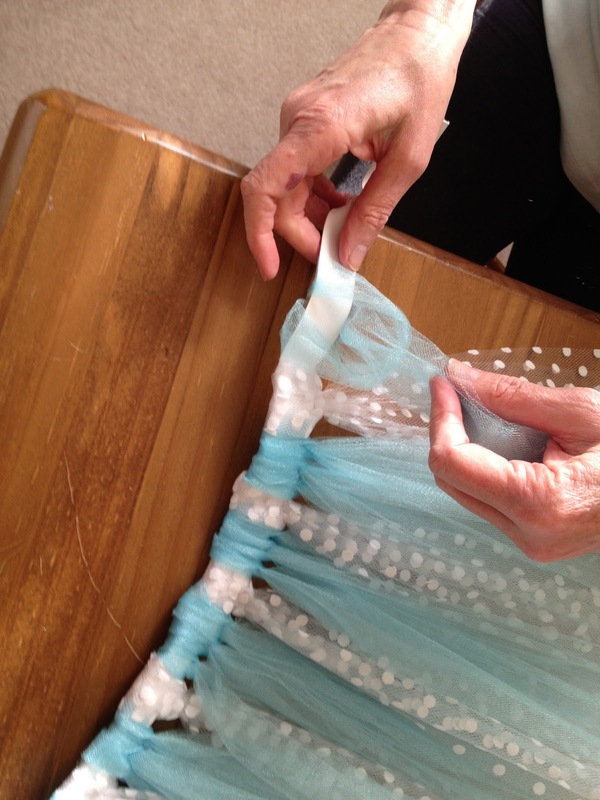 Knot the tulle onto the skirt. 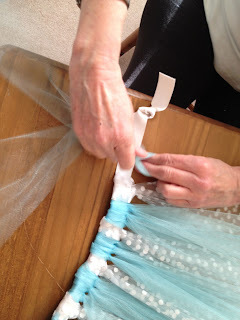 You place the double over tulle over the elastic and pull the ends the ends through the loop it makes over the elastic. I find this a little hard to articulate, so we have my friend Pat below showing you how to do it in pictures. After you've filled the elastic with the knotted tulle, sew the two ends of the elastic to fit your child. If you leave extra elastic at the end, you can take the tutu out easily when your tutu recipient gets a little bit bigger. FANTASTIC!! THIS IS WHAT I HAVE BEEN SEARCHING FOR!! GREAT JOB!! !